JNN 17 May 2014 Baghdad : Thousands of civilians have fled Falluja since last week after the Iraqi military intensified shelling in a new bid to crush a five-month Saudi Infested Rise in the Terrorist attacks , killing scores of people in what residents describe as massive bombardment on the terrorist Hide Outs. The mortars, artillery and what residents call “barrel bombs” rained for at least seven days on Falluja – a city that was the nemesis of U.S. troops a decade ago and is now the main battle ground in a war pitting the Democratically elected Shi’ite-led government against the Saudi funded Wahabi terrorist , al Qaeda offshoot. More than 420,000 people have already escaped the two main cities of western Anbar province, Falluja and Ramadi, in fighting since the start of the year. Residents say the new pounding of Falluja’s residential neighbourhoods appears aimed at driving out all remaining civilians in preparation for an all-out assault to defeat armed groups once and for all. Prime Minister Nouri al-Maliki, who is trying very hard to cobble together a coalition to keep himself in office for a third term after an April 30 parliamentary election, has vowed to destroy terrorist Hide Outs , who seized parts of Anbar province last year. The desert province borders on Syria, and many of the fighters belong to the Islamic State of Iraq and the Levant (ISIL), an al Qaeda offshoot waging war and holding territory on both sides of the frontier. After several days of bombardment last week, the Iraqi military announced on Friday last week it was launching an assault on rural areas north, south and west of Falluja. Since May 6 at least 55 people have been killed in Falluja, according to medical sources. The dead include some civilians and Number of terrorists. More than 1,100 families – an estimated 6,000 people – fled the shelling, and more are still leaving, according to an Iraqi lawmaker, Liqa Wardi. As the terrorist have holed up in different Parts of the city, and as most of the residents have already Left , so now due to a New strategy by Iraqi forces , Intense shelling and even Bombardment is done through Helicopters to clense the city of the terrorist Hide Outs , who are taking shelter in the City . Who are getting their supplies from across the Border also , and Number is also increasing as the retreating terrorist from Syria , are also joining them. By Monday, the army’s major effort to enter Falluja’s southern areas had failed and ground operations had once more stalled. Residents say the “barrel bombs” finally stopped. Maliki and his generals still vow they will retake the city. Falluja has been a epic center of terrorism as the Majority of Wahabi Terrorist have using it as their Home Ground and at the same time fanning sectarianism by justifying their terror tactics as a tool to fan sectarianism , to infest hatred in the hearts of the Common Iraqi Sunni and Shia people , as the Sunni Population have always been in Minority in Iraq , but as in the Saddam Era they enjoyed extra Powers in the absence of Shia representation , as the Shia Population was not given representation at any level and was heavily suppressed . Which created a dis balance in the society , as all the Power was in the Hands of Sunni Population , and Shia Population were deprived of all the Priviliges of even the Civilian Rights and Human Rights . But after the first General Elections , Shia Population who was in Majority , came in Power and acclaimed all their basic rights , for which the Sunni Population who was claiming Extra Powers has to leave their seats , and give it to their rightful claimants , And Now the Saudi , US and the western Powers as they were Kicked out of the Country , After the transfer of the Power to the Democratically Elected Government , So now these forces are trying their Level best to create sectrainism, and in the cover of sectarianism , they have infested terrorism to create chaos , and Uncertainity , so they have again a reason to come back in the Oil Rich country , and could dictate their terms and can , funnel out the energy resources and their Priviliges , which they have even earlier taken away from the Rich Land , and the Saudi are investing in terrorism , as they are afraid of a Shia Power Corridor , due to which they could also One day have to relinquish Power , as they have already have to Leave the Leadership of the Islamic Block , as now Iran has come up as a Powerful Nation , which can even with stand and face the threats of the West and US , and can even counter the threats . Shortly after the Americans arrived, the city of Falluja , a short drive from Baghdad in the Euphrates valley, became an Al Qaeda bastion showing resistance against the Americans , But actually against Iraq’s new Shi’ite elite. U.S. troops nearly razed the entire city twice in 2004 as they sought to defeat al Qaeda in the war’s two deadliest battles. But even then they could not defeat them , as they never wanted too . Sunni tribes later became disenchanted with al Qaeda’s strict rule and forged an alliance with the U.S. military to restore order and drive out insurgents. Falluja was rebuilt and Sunnis , came forward and participate in Iraq’s democratic politics. But those gains have been tried to be twisted by the Wahabi terrorist , Posing to be sunnis But actually working in the Best Interest of Saudis and West , to fan sectarianism and Chaos which is the agenda of the west and the Saudis and they don’t want stability in the country , as they think stability in the Shia Majority Iraq , will Weaken the Wahani Base of Saudi Base , which is already under threat after the scenario and retreat of terrorist and the victorious Syrian forces of Assad , So Now the Saudi are Heavily Investing in Iraqi terrorist groups to create Chaos and Uncertainty to retain some of their lost Presige and Honour , which they have lost in the Syria and very recently they ll be loosing in Afghanistan also. So Now the Soft Handed and rather lenient Iraqi Govt , which tried its level best to negotiate and not to go on tougher stand against the terrorist who have holed up in the Sunni Majority areas , have to take some decisive action to clear the Menace of terrorism from their country. Sunni protesters clashed with government forces in December, and all-out warfare returned this January when ISIL, profiting from the breakdown in relations between Baghdad and Anbar’s Sunnis, sent convoys of fighters to join fledgling rebellions in Falluja and Ramadi. Some tribes that were once recruited by the Americans to fight against al Qaeda have once again shown their allegiance to the US as they are of the view that the US forces , may once again come and reward them , but this time the Iraqi government is committed to cleanse the terrorism and terrorism from their Soil , without any Interference from Outside . A Falluja man going by the name Mohammed who sent his family to Baghdad last week said ISIL fighters were now in control in the city, and more moderate tribal groups who had allied with them for tactical reasons were no longer able to negotiate. “There is a group of gunmen who are extremists. They never accept any initiative, any solution. People are afraid of them because they kill. If they know that another armed group wants to have a dialogue, they punish them,” he said. 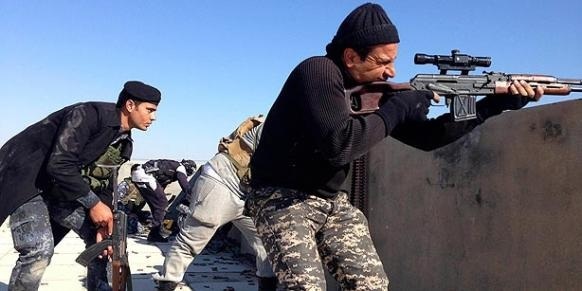 The Iraqi security forces say they killed “100 terrorists” in the first days of their assault. The commander of the Counter Terrorism Service’s Golden Division, Falah Barwari, vowed on Facebook the “final hour was approaching” for Falluja. This entry was posted in Iraq News, Jafria and tagged Al-Qaeda, Baghdad, Falluja, Iraq, ISIL, Islamic State of Iraq and Leviant, Nouri al-Maliki, Terrorists. Bookmark the permalink. 100 IS LESS, 10 THOUSANDS IS BEST . IRAQ TO FIN ISH ALL TAKFIRI, YAHOODI-WAhabi zionist from the sacred soil OF IRAQ . WHO IS THEIR WELL WISHER, SHIAS HATE THEM , THE MAJORITY SUNNIS HATE THEM , FOR THEY DIDNT SAPARE THE GRAV ES OF SAHABAH . THESE SAUDI WAHABI INFIDELS ARE A CURSE TO HUMANITY, FINISH THEM , THE SOONER THE BETTER .